SALT LAKE CITY, UTAH - The Utah ski and snowboard industry closed the 2014-15 winter season with a total of 3,946,762 million skier days, down 4.9 percent from the previous season’s 4,148,573*. This year’s number represents a 2.2 percent decrease vs. Utah’s 5-year average of 4,037,349. Nationally, skier days were down from 56.5 million to 53.6 million, a 5 percent decrease from the previous season. The drought in the Far West (California and Pacific Northwest) and the unprecedented amount of snow and cold temperatures in the Northeast resulted in decreased skier visitation in all six regions, as reported by the National Ski Areas Association. According to the National Weather Service, Utah’s statewide annual snowfall was 41 percent of average. Mother Nature assisted in the beginning of the season, with Utah ski areas recording between 100 percent and 130 percent above average snowfall as of January 1, 2015. This early season snow, in combination with resort investment in effective, energy-efficient snowmaking, resulted in another successful season. By comparison, total snowfall during the 1976-77 winter season was equivalent to this year, but skier days dropped 53 percent in an era before modern snowmaking equipment was available. “Utah’s resorts did an outstanding job, both getting the word out about early season snow conditions and ensuring that guests had an exceptional experience all winter,” says Ski Utah President Nathan Rafferty. **In May of 2015, skier days were adjusted slightly for the 2013-14 season from 4,161,585 to 4,148,573 due to a reporting adjustment from one of Utah’s resorts. 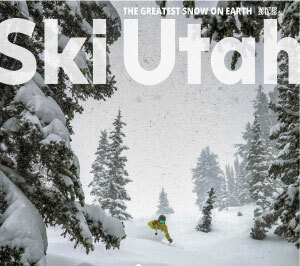 For media information or interviews, contact Ski Utah Director of Communications paul@skiutah.com. Ski Utah is a membership association representing Utah’s $1.3 billion dollar wintersports industry, including 14 alpine ski resorts and a membership of over 250 industry partners. The organization has been creating brand awareness of and demand for the Utah wintersports product since its inception in 1978. Ski Utah’s primary functions are concentrated in marketing, public policy and public relations. Information about Ski Utah and its members can be found at skiutah.com, on Twitter @SkiUtah and on Facebook at www.facebook.com/skiutahyeti.